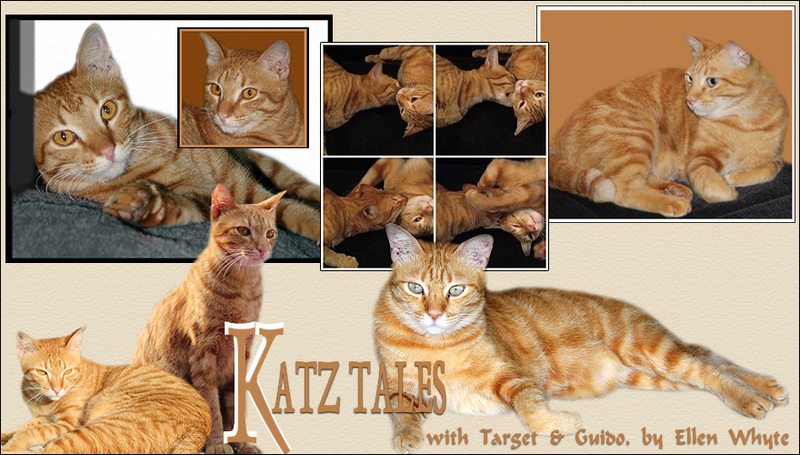 Katz And Other Tales: This Can't Be The Real Meaning Of Boxing Day! Everyone celebrates Boxing Day differently, but we bet few people do what we did. This morning we boxed Guido up - and took him to the vet. HELP! This can't be what Boxing Day is about!!! Guido was examined and then given his 5-in-1 vaccination. He enjoyed the ear rubbing (looking for mites) and the tummy rubs (checking organ functions) and he didn't even feel the injection thanks to Dr Vijay's stealthy practice of rubbing ears at the front while sticking a needle in the bum, but all the same, Guido was glad to get out of there. Target gave Guido a hero's welcome. "Oh my Cod! Are you ok?" Target asks. We are having roast pork for lunch, and Guido will have his own share. Happy Boxing Day! If you're looking for a good read, check out Logomania: Fate and Fortune that delves into the meaning and history of over 250 phrases. Arranged by chapter so you can check out phrases linked by common imagery, and indexed so you can find the phrase you want quickly, this little reference is packed full of information. Each entry also comes with an example so that learners can see how the expression is used. Click here to download a Sneak Peek printable PDF file. What a HORRIFYING way to be boxed! Guido, you deserve TWO portions of lunch. What a day for Guido! Oh well, if it's a scheduled appointment. Glad you got a scrumptious lunch. No I disbelieve that that is the meaning of boxing day! Boxing day is for PLAYING in boxes! By golly! Your Mom took you to the vet on Boxing Day!? She better give you as many helpings of roast pork you need to recover from this. I think Guido should have practiced some bare-pawed boxing after his ordeal! Ahhh, what a shameful thing to happen to a cat on Boxing Day! 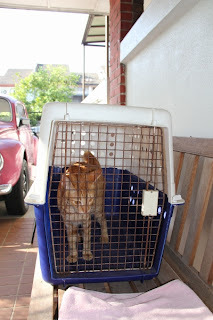 Poor Guido, still he looked as if he'd been very brave! Beautiful Guido!! You brave kitty!!! Me and Charlie hope you enjoy your roast pork!! Yay!! That's NOT what Boxing Day is! Maybe you should box your beans in return for that frightful experience. But you braved it like a trooper! Headbutts for you! What a brave little guy! Now that's taken care of, you can all enjoy the day! Oh no...that really doesn't seem like the way to spend a holiday!! Oh the other paw, roast pork sounds yummy. Guido, that is not the kinda box we like! But we're glad everything went well and you will have some roast pork! YUM! Stabby Place visits are awful, but necessary. We're glad to see he did well and has been released! Oh no! We are glad our Boxing Day is not like that. Yes, I agree, that is the wrong kind of box for Boxer Day fur sure! It looks like Guido handled his visit to the vet pretty well! This surely deserved an extra helping of pork. I read your previous post regarding the Tuxie cat. How wonderful that he is going to be okay. Many thanks to people like you who care about animals. What on earth could cause a human to injure a cat! Nothing! Him/her was just a rotten excuse for a human. that sure isn't the kind of box that Boxing Day is about but I am glad that Guido tested well so that makes it ok! We hope you got a large portion of roast pork Guido cos you deserve a whole pig for the morning you had! Poor Guido, spending boxing day at the vet ! Fortunately he didn't box him, lol ! Just read your post below. How can people be so cruel to animals, I will never understand. I would do the same to the person who did this ! Oh no. I've heard that it is also O.K. to eat any and all boxed food on that day. Dig in! So glad taht Guido survived the vet trip with flying colors. Way to go Guido. OH GUIDO! SUE!!! That can't be right. Call a Catyer! Yikers! don't you hate those boxes! they are not fun like the ones that treats come in. Hurray for being such a brave boy Guido! Now it is back to playing & fun with the brofurs! you're so brave Guido. hugs and kisses. hope you enjoyed your lunch. Guido, that is a terrible way to spend Boxing Day. I hope your Christmas Day was better. Oh Guido, not the vet. Glad you got that over with. Thanks so much for that kind email about BB. That was so nice of you to reach out. Take care. OMC! Guido, you had to go see vet on Boxing Day?? Well, we are glad all is ok and was just for scheduled appointment. Poor Sam has one of those coming up, too. Happy New Year to you, my friends! That is a new take on Boxing Day! Glad all went well. Guido did quite well on his big day. Hope he enjoyed his lunch. We thought that boxing day was for playing in cardboard boxes! Yikes, that's a tough way to celebrate Boxing Day, Guido! Not the type of Boxing Day I would want to celebrate. Guido you were a real trooper . Oh Guido! Thank goodness we didn't celebrate boxing day the way you did! Glad the trip went well, little buddy. We wish you all a 2012 filled with many blessings (and lots of roast chick-hen for da kitties)! OMC! Wot a way to spend Boxing Day! Give us a cardboard box anyday!!!!! Am so glad you survived your trip to the vet and you are all shotted up for the next year. Celebrate that that's over, for sure. That was as lousy done by your humans , to bring you to the vet on Boxing day as my mom buying toothpaste on the Boxingday sale for me !! Well, THAT'S not anykitty wants for Boxing Day! Sheesh! That's horrifying! I hope you got EXTRA roast pork.